As the introduction makes clear, A Toaster on Mars in not, actually, about a toaster or any other kitchen appliances. And the plot only meanders to Mars for its finale. The toaster in question is actually a cyborg character called Nicki Steel, wearing the epithet for robots made popular by the recent Battlestar Galactica reboot. 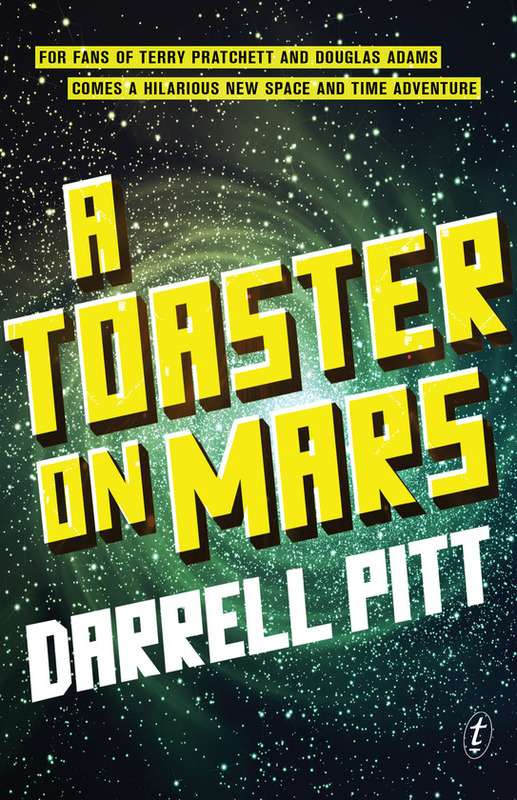 Set in the 26th century, A Toaster on Mars is a science-fiction comedy romp for kids. The paper thin plot involves detective Blake Carter and his new partner Steel going up against the universe’s worst bad guy named, unsurprisingly, Bartholomew Badde. Badde, Carter’s long-time nemesis, has kidnapped Carter’s daughter and blackmails him into steeling some high tech equipment. The rest is a series of capers, battles and chases across Neo City, built on the ruins of the US east coast, with brief pauses for additional comedic interludes. Pitt is clearly a Douglas Adams fan. The opening monologue by editor Zeeb Blatsnart (even the name feels Adams-inspired) and many of Blatsnart’s italicised asides during the plot are essentially Adams-light, and many are reworkings of Adams’ ideas. Similarly, many of the plot devices – a killer-mutant cheese sandwich, a pocket universe full of Elvises, snarky artificially-intelligent appliances – seem to come out of the Adams back catalogue. But this is a comedy book for kids, probably about 8 – 14 and (having road-tested it on the intended audience) it works well for this age-group, barrelling along and generating plenty of laughs. There is a problem, though, with some of the humour given that the aim is a younger audience. References to historical figures like John F Kennedy, Nixon and Marilyn Monroe, and extend section that riffs on Elvis songs, may be amusing for Gen-Xers but are likely to leave kids scratching their heads rather than laughing. They would have found a pocket universe full of Justin Timberlakes or Katie Perrys much funnier. This review first appeared in Aurealis #93, Australian Science Fiction and Fantasy Magazine, www.aurealis.com.au.